Adaptivation was born out of necessity, and founded in functionality, durability, and quality. This ethic continues to guide our assistive technology service to individuals with mild to severe and multiple disabilities. Our customers' input and suggestions often are incorporated into new versions of our products. Our products have earned a reputation for affordability and continue to do so. Adaptivation continues to create new ideas and plan products useful to individuals with special needs. Our goal is to let our products speak for themselves (some literally) so each time we introduce a new assistive device, our customers know, without ever having seen it, that it is practical, well-built, and backed by personal attention. 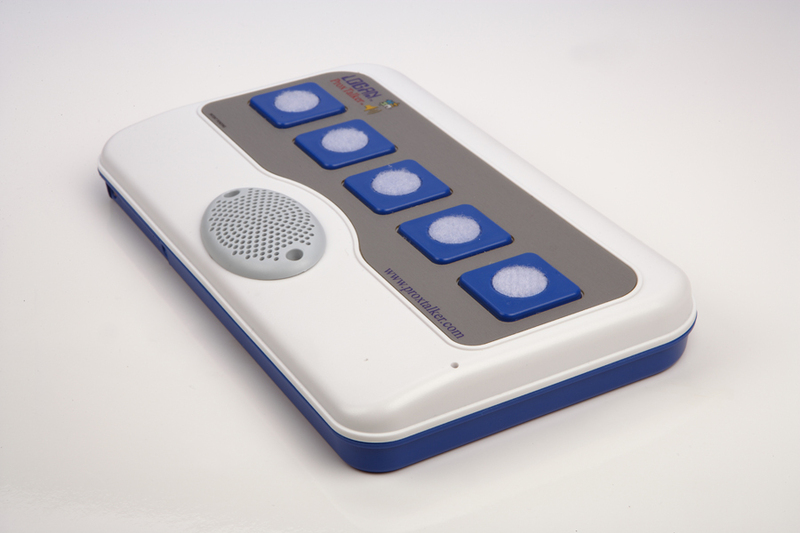 The LOGAN® PROXTALKER® communication device is an exciting mid-tech device which uses RFID technology to retrieve vocabulary stored on sound tags to produce REAL words. Ideal for any picture exchange system user of any age - for communication or as a classroom tool. Just Pick a tag, Place it on a button and Press - the PROXTALKER® device will say the appropriate sound, word or sentence. Easily adjustable volume, inbuilt microphone, sound tag can store up to 8 seconds of recording, 1GB memory, (30,000 sound tags/1,000 minutes), powered by four C batteries (minimum of 6 months battery life in use). Device available in blue, gray, or pink. 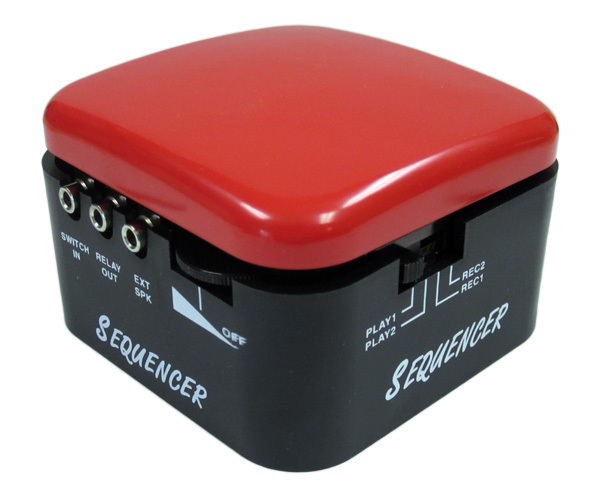 The Sequencer is a communication aid that allows you to record and play back messages in sequence. The Sequencer has 3 minutes of record time, 90 seconds per level. Each level is recorded independently. Can also be used as a single-message device! The Sequencer has an external switch jack, an external speaker jack and a relay jack for cause-effect. The Sequencer has excellent sound quality and a long battery life. 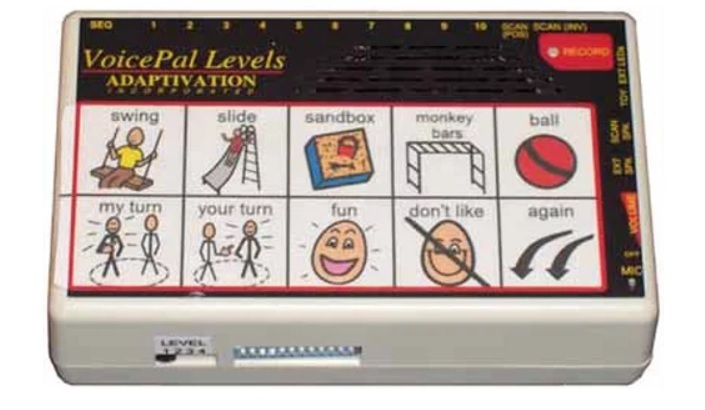 The VoicePal Levels is a four-level, customizable, natural-voice communication aid for anyone experiencing communication challenges. The VoicePal Levels is a perfect evaluation tool and can adapt to the growing skills of an individual. It is portable, lightweight and has many programming options. Messages can be accessed by direct selection using the on-board keypad, by plugging adaptive switches into the external jacks or by scanning, either visually or auditorily. Slip a symbol or picture overlay into the built-in pouch to customize the keypad (2, 3, 5 or 10 messages). Total record time is 17.5 minutes. For further details, see the "Quick Setup Guide" or the manual. Includes four AA batteries. Dimensions: 6 in x 3.5 in x 1.75 in. Weight: 1.5 lbs.